The city of Chicago publishes CompStat data for each district (example here), and these weekly reports compare crime statistics, typically violent crimes that concern most citizens like burglary, robbery, criminal trespass and more. From the reports command staff can measure how the districts are performing. If the district is not showing improvement, the district has to answer for this, and that's when additional pressure on officers for improvement follows (aka quotas). These CompStat reports are also available to anyone in the community paying attention. They are usually shared at neighborhood CAPS meetings. So here's a novel idea: What if Chicago published weekly CompStat data based on ward, not district. Like the following. Below are current year's incidents of crime (Homicide, Burglary, Robbery, Assault, Battery, Criminal Sexual Assault, Criminal Trespass, Theft, Weapons Violation) compared to the previous two years. By looking at crime by ward, aldermen could share in the responsibility of crime rates - it would no longer just be "the police's fault" if crime was on the rise. Taking this idea a step further, what if we could remap the ward boundaries to match the police district boundaries? There are currently 22 police districts in the city of Chicago. We, citizens, could ask for a reduction in the total number of wards from 50 to 22. Because let's all be completely honest, does anyone really believe we need 50 aldermen to run the city? This reduction would of course mean 28 aldermen would be out of jobs, but think of the savings. Chicago politicians are all about cutting out fat, like, for example, when they eliminated three police districts, and called it "efficiency" and a move to stop a "redundant administrative structure". 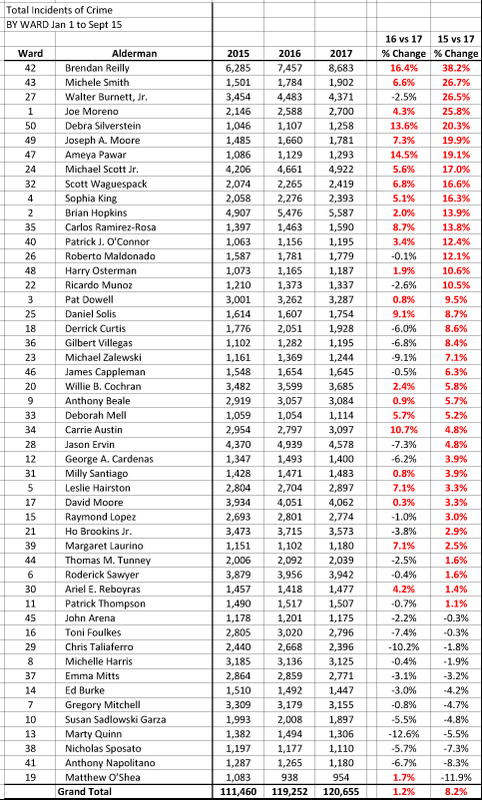 By cutting out these aldermen's 27 salaries, Chicago could save 3.2 million dollars (based on an average of $118,000 salary per alderman, as of 2015). Furthermore, there would be savings from fewer staffing needs at each ward. This would be another 4.2 million in tax dollars saved (at roughly $181,800 per ward). So almost 7.5 million in savings in salaries ALONE. 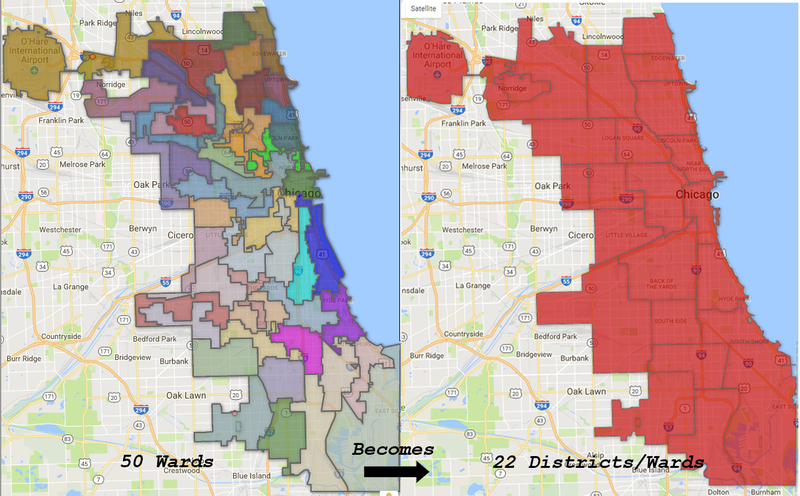 This is just the beginning of where we could find precious dollars by efficiently reducing Chicago from 50 to 22 wards. Imagine a city with fewer wards and aldermen. There are other benefits. For one, no more ridiculous ward mapping. On the left side of the image below is the current ward map of Chicago. On the right is the current police district map for all of Chicago. Chicago residents would finally understand what ward they live in and what police district they live in - because we would combine the ward/district and they would be the same. The best part is by having a ward and district combined, it would allow aldermen to take a more visible position of responsibility for Chicago's crime to properly take ownership of the city's violence. For example, if an angry citizen calls the police station and complains about crime, the caller could easily be passed to that same district's elected alderman, an official who actually participates in making policing policy changes. Or when a citizen complains to officers about a 30 or 45 minute response time for a robbery or burglary, the officer can simply say, "I'm sorry we are in RAP status - we have been for days. We can't afford enough officers. Please call alderman x of our district, who is in charge of the city's budget and financial oversight." Finally, as the crime continues unabated, and it becomes clear to everyone the Kim Foxx social justice experiment has failed - as it is so brilliantly doing before our eyes - police districts can simply direct the complaints to the district alderman, who, more than likely, blindly supported the election of Kim Foxx for Cook County States Attorney in the first place. I'm in. Please take 1st ward alderman Moreno's salary and his expense accounts and put them toward hiring another well trained police officer or two. An alderman taking responsibility for crime? And owning the violence that he/she is responsible for? not gonna happen. Why is it you never see crime statistics per ward? I'm not and I know you aren't blaming all the violence on the aldermen, but they certainly will not take responsibility for this. at. all. This says more about Chicago voters than aldermen in the end. Lemmings is what Chicago voters are. Aldermen will do nothing in the war currently being waged in the streets of Chicago. They will continue to blame the police meanwhile their constituents, the voters, will suffer the consequences. They are too afraid to talk about the truth -> so many young African American and Hispanic children have grown up without parental guidance and turn to gangbanging because they need somewhere to belong. No amount of education, job training will help so many 15 to 35 year old's, convicted of crimes and without a job -> They have no skill set other than 'banging. -> We live in troubled times. Oh look, Michele Smith, you've led our neighborhood to the top of the list ! Thanks for that! Own it Michele! Only one or two aldermen north of the Ike have any input over manpower or staffing of the districts in their wards. The Mayor runs CPD. Don't be fooled into believing Eddie Johnson is anything but a figurehead. It's clear you can't stand Kim Foxx. So how do you explain that crime was just as high under her predecessor, Anita Alvarez? You know, 16 shots and a coverup Anita? It should come as no surprise that she got ousted after that fiasco. Oh there’s no doubt the anti-police movement began before Kim Foxx became SA. She has just added fuel to the fire, a fire that is becoming an inferno. Foxx ran on 2 major themes: going soft on crime and villainizing the police - and she’s been true to these commitments. What’s remarkable is the shock and surprise of the Chicago community in the rise of crime since she HAS been in control.